I may be one of the few people on earth who actually liked Kill Team. This is, like, the best possible 40k news short of an announcement for Dawn of War 3. Great news! Makes me want to reinstall Space Marine again. The only thing that was awful about that video was the fact I had to wait for a 30 second commercial to end for a 25 second trailer. Company of Heroes 2 was about to get released. Relic is pretty small, and I don't think they have enough to have both projects in the pipe at the same time. Love the Van Helsing games and I always thought that the WH40K source material would be excellent for a Sci-Fi Diablo like ARPG. Hmm a "sandbox" action rpg. I wonder if they mean sandbox or alluding to something akin to paragon levels. It sounds like randomly generated "dungeons" as you move to new "planets" after finishing the scripted Single Player Campaign. So maybe like the Bounty Concept in Diablo. Very very interested in this. The Van Henslings games are very good. I'd love for them to do something different with the genre. Less linear would be a good first step. I would love to see an ARPG that really focused on control of a small team rather than a single character. One of the things I liked best about Dawn of War II was having control of a squad of guys centered around a hero leader. And, the Van Helsing games had a great pet summoner class along with a permanent ally character. It's just baseless speculation on my part, but it seems like some of the DNA is in place. But then, I'm still waiting for a real spiritual successor to Dungeon Siege. I imagine the squad aspect will be handled by coop. That how imagine it will work. Perfect for me as I imagine I'll be going through this with a buddy*. *We're currently playing through DoW II. Wh 40k loot pinata game? I'm in! Unless it is only singleplayer... Then it is a maybe. So I'm imaging Dawn of War and Diablo merging together? Would that be what this is? I suspect it will likely be a Van Helsing "like" ARPG with a 40K "reskin" for monsters, weapons, and abilities. You could play Van Helsing and see the clear pulls from Warhammer Fantasy's "Witch Hunter" class/character and some of the world building. There is nothing wrong with any of of that - VH is a great ARPG. I dont think the character building will be as deep as say, Path of Exile - I suspect it will be similar to VH and Diablo's limited skills. I think the big pull will be the WH40K weapons, lore, and monsters. Given the cyber augmentation prevalent through WH40K - I suspect there will be ways to incorporate that into your character "build". It would be cool to see a Ravenor/Eisenhorn "Inquisition Team" mechanic similar to the squad in DoW2, but I doubt it will make the first iteration of the game. There's also a full on Vermintide thread. However I'm not sure if you are talking about Inquisitor or Vermintide now. Here's the Warhammer 40K: Inquisitor-Martyr video. Just waiting for an official release date. Only thing I can find is a brief mention on various websites for 2017. So I bought into the founders pack a while ago and have popped in now and then to see how development's going. I played for a few hours over the weekend and really like what I've seen. Skills and combat felt pretty good. It's still early as hell (not even a Steam EA release). There's 6 classes so far and skills are based on the weapons you have equipped. My biggest complaint is that feedback isn't great (enemies barely react to getting shot, skills have too subtle animations, etc), your character moves very slowly, and I've only encountered two quest types and both have been running around a single space hulk tileset killing everything in my path. They haven't released any story content so a lot oft he game is reading tooltips and guessing about what does what. I completely forgot this exists. The Stream page says full controller support, so I'm stupid excited. 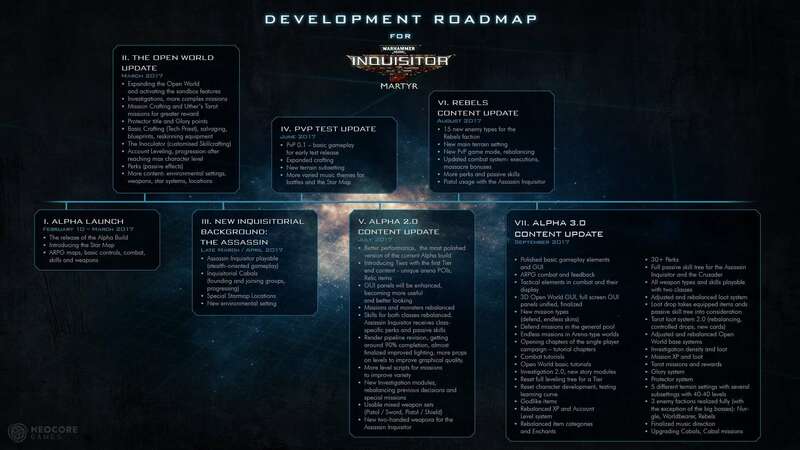 Man, rereading the start of this thread is a bit of downer now that DoW3 is out. Played some more last night and ran into a different mission type but it was still go through a corridor space hulk. At this point, there's only the forces of Chaos and no other enemy types. It all feels extremely samey. There's a very solid base that needs A LOT of work around it. The one thing I am concerned about is the leveling system. Right now, it feels extremely anemic and is just adding small percentages on to stuff. You don't seem to get anything special until way further down the trees and even those are passive bonuses. What are the 6 classes or where can I find more videos on the game? The website is very thin on specifics. I've detailed this out for you. They have a basically your class (Background) and your subclass (Expertise) that you choose right from the start. These determine your starting weapons, gender, and armour. Each background has a secondary resource that is needed to use Armour abilities. All Crusaders are male and all Assassin's are female as of right now. On top of this you also have an equippable item that can be swapped between any class. I've seen a time bubble, stun mines, critical chance increasers, etc. These are limited but you find supply boxes along the way that replenish this. They have Psyker background in the list but it is currently greyed out. As of now, the Psyker isn't even on the road map. I've only played the Assault Gunner class. It's a class focused on ranged and sustained fire so I haven't tried out any of the melee. If you have any questions, I'm more than happy to answer.